The Odrysian Kingdom was a state union of over 40 Thracian tribes and 22 kingdoms that existed between the 5th century BC and the 1st century AD. It consisted mainly of present-day Bulgaria, spreading to parts of Southeastern Romania (Northern Dobruja), parts of Northern Greece and parts of modern-day European Turkey. 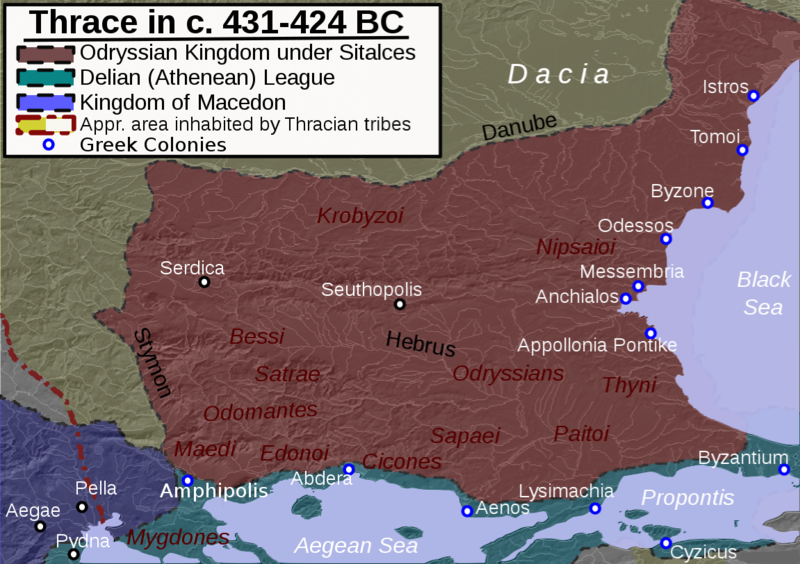 The Odrysian kingdom had maintained continuity with its own kings, but broken up into several kingdoms (including Canite and Odrissae) by the early second century BC, until succumbing to complete Roman conquest in 146 BC. In 100 BC a Thracian kingdom was restored, possibly by a son of Beithys, one of the last kings of the Odrissae, it is not clear if it was a vassal of Rome or entirely independent. The Odrysian king was murdered by his wife and his kingdom was completely subjected to Rome in 46 AD.